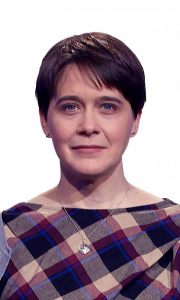 Jeopardy champion from earlier this season Lori Goodman has collaborated with other Jeopardy contestants to create the Jeopardy-style Haggadah supplement you didn’t realize your Passover Seder needed! James has cemented his spot in the next Tournament of Champions. Our ToC Tracker shows who else is in the field. 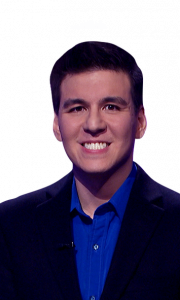 If you’re curious to see how his stats so far shape up to those of Ken Jennings, you can find them at A James Holzhauer vs. Ken Jennings Statistical Comparison. Did you write any of the online tests last week? You can find last week’s questions and answers here! Correct response: What is the raising of the flag on Iwo Jima? The United States Postal Service originally rejected the idea of a stamp commemmorating the flag raising at Iwo Jima in 1945, because “no living person(s) can appear on a US stamp”. However, the USPS relented to public and Congressional pressure, and the stamp was released in July of that year. Over 137 million of the three-cent stamps were sold. An average of 3.1356 5+-time champions (standard deviation 1.2283). An average of 4.8859 4+-time champions (standard deviation 1.5224). An early cutoff took place 0.549% of the time (or a 5-game winner will be left out). 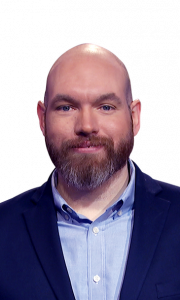 Eric R. Backes qualified 84.859% of the time. Anneke Garcia qualified 60.451% of the time. Lindsey Shultz qualified 28.159% of the time. Dave Leffler qualified 6.345% of the time. Jonathan Dinerstein qualified 0.521% of the time. At $460,479, James moves to #2 on the all-time regular-play winnings list (passing David Madden and Julia Collins), and #10 all-time overall. 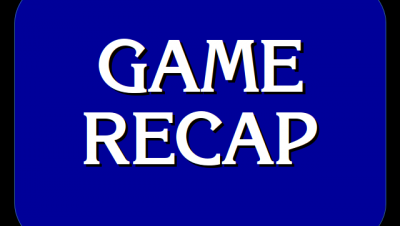 The data provided on the Jeopardy! site is not entirely correct; it is missing the All-Star Game winnings for each team that did not make the final, it is missing Jerome Vered’s winnings, and it also has transposed two digits in Colby Burnett’s winnings. The difference between James and Megan in today’s game is the difference between a player who has figured out the timing of the signaling device and a player who has not. I would posit that if this were a written test between the three players, that James and Megan would have scored very similarly to each other. 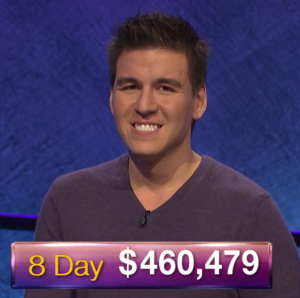 However, James has been able to master the signaling device; thus, he has been able to control the flow of the game, have confidence that he would be able to do well, and have enough money to be able to recover from having missed the first Daily Double. Because I bet that at least one viewer will be incredibly confused by this: The ONOMATOPOETIC WORDS category consisted of words whose letters were contained in the word ONOMATOPOETIC, not words that were actually onomatopoetic. Effective in first on buzzer stats: James 64.29% (36/56), Kevin 23.21% (13/57), Megan 12.50% (7/56). In case you’ve never noticed before: there’s a white light at the bottom left of Kevin’s podium in this screengrab with Alex looking at and pointing. That light is there so that Alex does not forget who gets to pick the next clue, either after a break or after a Triple Stumper. 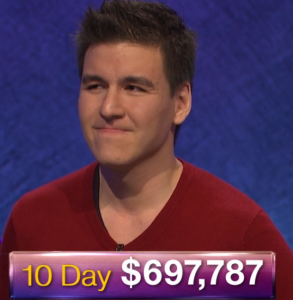 11 Comments on "Today’s Final Jeopardy – April 15, 2019"
is james the new ken? Hey Andy, is it true that there’s never been a Stamps FJ before? Although I thought the answer was easy, the category would have been off putting to me and I would have bet nothing. Yes in the respect that just “STAMPS” hasn’t been the category title. No in the respect that according to J! Archive, it’s been called POSTAGE STAMPS or U.S. STAMPS, so really, it’s been done before. Dude, you are awesome with details. Seemed unlikely that they’d never done that before. Thanks! I wonder if “(the) raising of the flag” would’ve been acceptable? I’d argue they should take just “Iwo Jima” given that’s all the stamp itself identifies it as. Our cable station lost feed at the last commercial. Ouch! Had to search for question and who won. I’d have wagered the question would have involved the inverted Jenny airplane. This is why I’m not competing on the air. Matt Jackson opened 7 for 8 in terms of runaways as well.